“Egypt is the Gift of the River”, said Herodotus, the Greek Historian in the 5th Century BC. Rightfully so. Kingdoms came and went, dynasties rose and fell. But the Nile continued, steadfastly, year in and year out, with its rise and ebb to irrigate, fertilise and nourish a civilisation that endured 3,000 years of history. Ancient Egypt was geographically divided into two parts, Upper Egypt on the banks of the Nile River and Lower Egypt in the Delta. In 3100 BC King Narmer, the first Pharaoh of the First Dynasty, united Upper and Lower Egypt, laying down the foundations for the first united nation. Flowing over a distance of 6,400 kilometres, the ‘White Nile’ from Uganda is joined by the ‘Blue Nile’ from Ethiopia in Khartoum to become Nile proper. From Khartoum to the Mediterranean Sea the river gashes through 3,000 kilometres of desert, creating a slim oasis 1.5 to 20 kilometres wide on its banks. The Nile River has a life of its own as it flows through Egypt. Gushing through dark granite boulders in Aswan, it transforms itself to serene, tranquil waters shimmering like silk past the temples of Kom Ombo, Edfu, and Luxor, and in Cairo it becomes a vast expanse reflecting the very soul of the city. Date palm trees cluster together at the banks, behind them the omnipresent red granite desert. The economy, political structure and the very values and outlook of the ancient Egyptian people were fashioned by the river. Providing prosperity and security, it created a people, cheerful and optimistic, pragmatic and easy-going, accepting the bounty of their land unquestioningly. The Nile provided Egypt with all its wealth and made it from the outset an agricultural nation, providing grain, oils and ranching land, and mud for building houses and palaces. Papyrus grew abundantly in the marshes of the delta. The Egyptians used its stalk to make writing material and exported papyrus sheets to the ancient world, helping to spread the knowledge of writing. The desert immediately adjacent to the river was rich in gold, semi-precious stones, and stone for building temples and tombs and at the same time protected the people from invasion from its neighbours. The river was also an excellent means for distribution and communication. 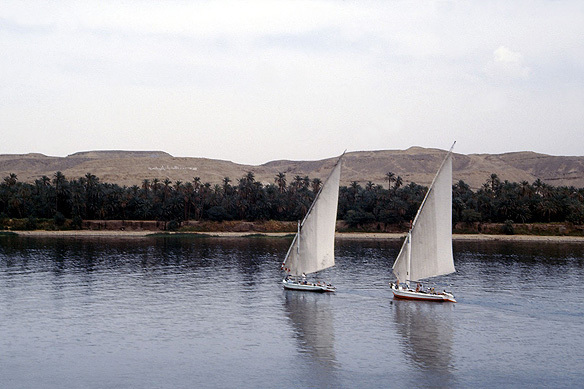 Water transport of all shapes and sizes ploughed the river enabling contact between the major Egyptian towns and cities which were built on the banks of the Nile. There was not much the Egyptian wanted for. The Egyptians developed the earliest known calendar year based on the three seasons/ behaviours of the Nile. The Egyptian year was based on the sun and had twelve 30-day months followed by five additional festival days. Once a year, Sirius, the brightest star in the skies rises on the eastern horizon a moment before dawn. The Egyptians noted this occurrence tied in with the annual flood of the Nile and fixed the moment as the beginning of the Egyptian year. Torrential rains in Ethiopia led the Nile to flood in Egypt from June to September. From October to February, the waters receded during the season of emergence, leaving a layer of black silt called kemet that fertilised the soil. February to June was drought. The floods could either be a blessing or trial depending on the level of water. There was a thin line between famine and destroyed villages. The Nile gods were rightfully worshipped in ancient times, believed by the early Egyptians to be responsible for their very fates. The Nile brought about the need for centralised authority which was necessary for a stable existence. The early Egyptians had a special gift for cooperation and organisation. From Pre-Dynastic times (3100 BC) they had realised the need to harness and control the river. Dikes were built to prevent flooding, catch basins and wells dug to trap and hoard water during emergence, irrigation canals built to take the water to the fields further afield, and nilometers built at Cairo and Aswan to measure water level. The organisation of Egyptian labour revolved around these same three seasons. In ‘emergence’ they planted the soil, and tried to catch and store the receding water; drought saw them harvest and thresh; during ‘inundation’ flood, the work force took part in the pharaoh’s building projects. The period of inundation was also ‘festival’ time. All work paused long enough for everyone to join in the celebrations of great religious feasts. These lasted from five days to several weeks at times and were held at the State’s expense. The banks of the Nile River embodied prosperity, a place of continuity. The desert was about death and burial grounds. During the last 700 years of Egyptian civilisation, Egypt was fought over by a succession of native and foreign rulers, finally conquered by Alexander the Great in 332 BC. When Alexander died in 323 BC, his Greek General, Ptolemy, who had been Governor of Egypt, became King. 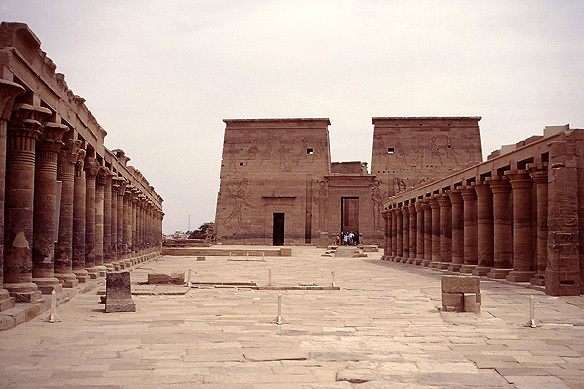 The Ptolemaic dynasty built temples on the banks of the Nile River at Philae, Kom Ombo and Edfu to reassure Egyptians that their gods were being respected and to confirm the Ptolemies as rulers by ‘divine right’. The arrival of Augustus in 30 BC brought about the deaths of Antony, Cleopatra and subsequently Ptolemaic Egypt. 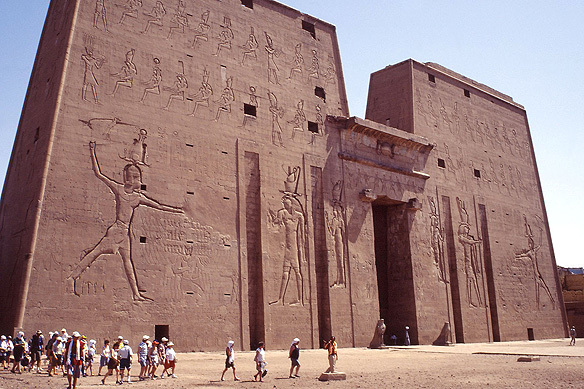 This entry was posted in Egypt, Exploring our World and tagged Alexander the Great, Ancient Egypt, Edfu, Egypt First Pharaoh, Egyptian Civilization, Egyptian History, Nile Cruise, Nile River Gods, Philae, Ptolemaic Dynasty, Things to see in Egypt, UNESCO World Heritage Site by Rama Arya. Bookmark the permalink.